What's Happening in the Pittsburgh Diocese for YOUNG ADULTS! ~ The Transgender Moment: Understanding and Responding to Gender Identity in Contemporary Culture will take place on Friday, April 5, and Saturday, April 6, 2019, at Franciscan University. Registration is $50 for guests, and free for Franciscan University students, staff, and faculty. For a complete schedule, speaker biographies, a schedule of events, and to register, visit www.franciscan.edu/veritas/events. ~ Click here for YOUNG ADULTS' Service Trip on JUNE 22 TO JULY 6, 2019, by DIOCESE OF PITTSBURGH, to SANTIAGO DE COMPOSTELA, Spain. 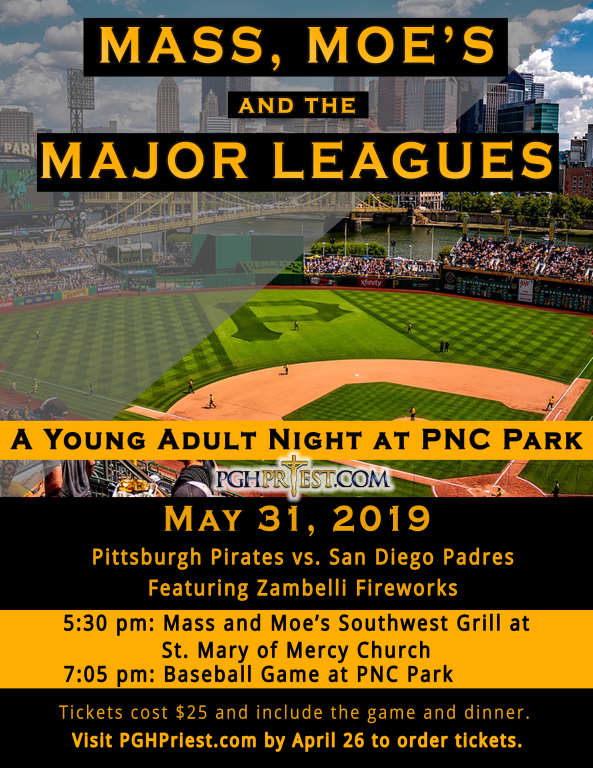 Come enjoy a Pirates game and fellowship with other young adults! We will meet for Mass with Father Mike Ackerman at 5:30 pm in St. Mary of Mercy Church, followed by Moe’s Southwest Grill for dinner downstairs. Following dinner, we will walk to PNC Park for the Pirates vs. San Diego Padres game with Zambelli Fireworks. Click here for more info or Tickets…are limited, cost $25, and are available until April 26.